Now it has gone beyond that. Teachers want to communicate their concepts to every student in a manner that they want to be sure that what they teach is the same as what the student grasps, and this can only be done using VR. Through a mobile VR headset, every teacher can not only teach students complex concepts in an exciting manner, but can also have ‘the hold’ on students’ interpretations of what he/she has understood. On the flip side, students are also taking massive interest in VR and are coming up with their own concepts of visualizations and apps. Applications such as World of Comenius or Drash VR’s Titans of Space have been the talk of the town for quite some time now. With VR, students can learn from an era that passed centuries before they were born, they can experience the universe in a manner that no planetarium could show them but also ‘see’ the inside of an atom and grasp the basic of the basics. Now the question is: Can every school afford an Oculus Rift or a Samsung Gear VR for their students? The answer is pretty simple, “No”. Although Google Cardboard is relatively cheaper for the students to buy, the ever-evolving world of virtual-reality has a lot of surprises for us in the near future. Google plans to enhance its $20 cardboard headset. Alphabet Inc. is developing a VR headset that is said to be a one-of-its kind all-in-one mobile headset. The plastic viewer will have computer chips and sensors, and will use a smartphone as a screen. Talking about making it easy for schools and students! Google’s innovation in VR will surely give a good competition to their Facebook rivals whose Oculus headsets would be ready for shipment from next month. 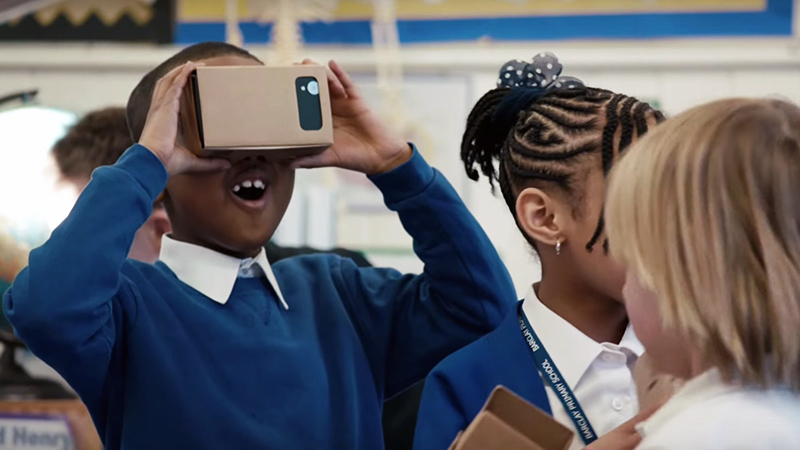 By taking its low-cost cardboard headsets to the next level, Google can cater to a large number of future VR brains, currently studying in different schools throughout the world. This is great for both students as well as the teachers who couldn’t teach, explore or experiment with Virtual-Reality due to it being over-priced. This is great for the world of VR itself! With economically feasible innovations like these, we are introducing new horizons especially to students – ensuring that everyone who is living in an ‘actual reality’ has the right to live and prosper in Virtual Reality as well.